A solid cast of seven older horses that have combined for 11 stakes victories and more than $5.3 million in purse earnings are scheduled to face off in Saturday night’s 26th running of the $100,000 Ack Ack Presented by GE Appliances (Grade III) at Churchill Downs. The one-turn mile race is one of four stakes events scheduled on the penultimate racing program of the track’s 11-day September Meet. Also on the Saturday schedule are the sixth running of the $200,000 Lukas Classic (GIII), a 1 1/8-mile race for 3-year-olds and up; $100,000 Jefferson Cup (Listed), a 1 1/8-mile event for 3-year-olds on the Matt Winn Turf Course; and the 1 1/16-mile President of the UAE Cup (GI) for Arabian-bred horses. The Ack Ack is scheduled as the eighth of 11 races on the program that begins at 6 p.m. (all times Eastern). Post time for the Ack Ack is scheduled for 9:39 p.m. Leading the Ack Ack field is Charles Fipke’s 2017 Clark Handicap (GI) winner Seeking the Soul. Trained by Dallas Stewart, Seeking the Soul (20-5-4-5—$1,421,162) attempted to parlay his half-length victory in the Clark to the $16 million Pegasus World Cup (GI) on Jan. 27 but finished fifth, beaten 14 lengths. The 5-year-old son of Perfect Soul (IRE) resurfaced in the $100,000 Schaffer Memorial at Indiana Grand on July 14 and finished second to the Brad Cox-trained Pioneer Spirit prior to a sub-par finish 13th-place finish in the Woodward (GI). Seeking the Soul, who has finished off the board only twice over the Churchill Downs dirt surface (7-2-1-2—$365,812), will be ridden by Brian Hernandez Jr. and break from post position No. 6. Stewart won the Ack Ack in 2016 with G M B Racing’s Tom’s Ready. Invading Churchill Downs from his base in Southern California is Exline-Boarder Racing, Gratto Racing and Garrett Zubok’s San Antonio (GII) and Pat O’Brien (GII) winner Giant Expectations. Trained by Peter Eurton, Giant Expectations (15-4-3-1—$1,135,200) defeated five rivals by 3 ¼ lengths in the Dec. 26 San Antonio (GII) at Santa Anita Park by 3 ¼ lengths. The 5-year-old son of Frost Giant began his 2018 campaign with a ninth-place finish in the Pegasus World Cup, which was followed by a fourth-place effort in the Santa Anita Handicap (GI). Giant Expectations was not originally nominated to the Ack Ack but his connections paid a $3,000 supplementary nomination to become eligible for the race. Julien Leparoux has the call and will break from post 2. Also entered in the Ack Ack is Flank Fletcher Racing’s four-length Kelly’s Landing winner C Z Rocket (7-4-0-1—$204,075) who, most recently, finished fourth in the Aug. 25 Forego (GI) at Saratoga. The lightly-raced son of City Zip, trained by Al Stall Jr., will once again be ridden by Shaun Bridgmohan and break from post 7. 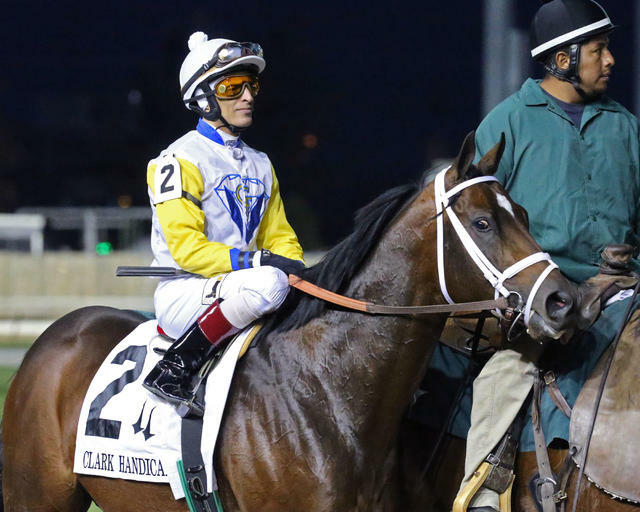 The Churchill Downs Racing Club hope to continue their fairytale story Saturday night with two-time stakes winner Warrior’s Club (27-5-6-5—$703,104). The Warrior’s Reward colt, who won the 2016 edition of the Spendthrift Juvenile Stallion Stakes and 2018 Commonwealth (GIII), was the runner-up in Saratoga’s Alfred G. Vanderbilt Handicap (GI) on July 28, and most recently finished last of eight in the Aug. 25 Forego (GI). The Churchill Downs Racing Club, which consists of 200 members, paid a $500 club fee which grants access to a behind-the-scenes look of horse ownership. To date, more than 50 club members have branched off and joined other horse ownership groups. Warrior’s Club will break from post 4 with jockey Chris Landeros in the saddle. Also entered in the field is Live Oak Plantation’s five-time winner Awesome Slew, who will attempt to defend his 2017 Ack Ack title. The 5-year-old son of Awesome Again, trained by Mark Casse, has not found the winner’s circle since last year’s one-length victory. Leading rider Corey Lanerie has the call on Awesome Slew and will break from the rail. The complete Ack Ack field, in order of post position (with jockey, trainer and morning line odds): Awesome Slew (Lanerie, Casse, 6-1); Giant Expectations (Leparoux, Eurton, 3-1); Flatlined (Joe Rocco Jr., Scooter Dickey, 20-1); Warrior’s Club (Landeros, D. Wayne Lukas, 6-1); Nice Not Nice (Gabriel Saez, Buff Bradley, 20-1); Seeking the Soul (Hernandez, Stewart, 2-1); and C Z Rocket (Bridgmohan, Stall, 2-1).